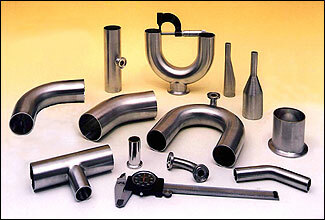 Top Lines BPE fittings are certified and 100% compliant with full material traceability. We have sizes ranging from 1/2” through 4” in both automatic weld and hygienic clamp ends. 6” fittings are also available. Our precision crafted automatic weld fittings provide reliable technologically advanced components which are designed for today’s high speed automatic weld equipment. Our automatic weld fittings are provided with sanitary finishes that meet or exceed pharmaceutical process specifications with a wide range of complimentary products. These pharmaceutical fittings are manufactured to dimensional specifications per BPE and demonstrate cost reduction to third party users due to decreased rejection rate. Top Line has been supplying high quality stainless steel products to the pharmaceutical industry for over twenty-five years. Our commitment to fine craftsmanship, responsible service and realistic pricing has led to our company’s successive years of growth. Our modern, well equipped manufacturing facilities are staffed by skilled and dedicated craftsmen. Consistently meeting important tolerances and finish specification is of primary concern to us. Before any products leave our plant they are subjected to rigid quality assurance checks. If you’re interested in receiving a custom quote, or to get more information, on pharmaceutical fittings, please contact us at 800-458-6095 or click the green “Request a Quote” button below.